Is November here already? Hard to believe. 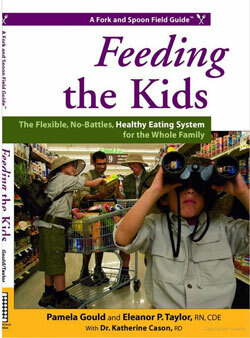 So anyway, to keep in line with the whole healthy eating run, I thought I would read Feeding The Kids by Pamela Gould, and Eleanor P. Taylor RN CDE. Dinners at our house were a constant struggle. My brothers fought about eating everything. We mainly had green beans or corn for a veggie because those were the least traumatic. My brother Jeremy would sit at the dinner table FOREVER, would coat everything with ketchup, try to feed it to the dog, hide it in his napkin - you name it, he did it. This book is all on how to avoid these situations at your dinner table, how to choose Smart Foods and how to avoid Empty Foods and those foods that are In-Between. I like that it was a 6 week introduction so you didn't have to make a huge change all at once, which we all know would be anarchy. I also like that the book gets the kids more involved and acknowledges that you're going to eat Empty Foods. I don't need to tell you what those are - we all know them and some of us love them more than others! The book also has great tips for deciphering food labels - there are more hidden things in food than you think! So if you want to learn to navigate the grocery store better, raise healthier kids and get rid of the stress of getting them to try new things this is a good book for you. Don't force your kids to eat everything, encourage them to try things and offer it to them, let them put a few peas or whatever on their plate but don't force them. I like this food tasting test (p14) - have a "secret tasting". No one can comment on the food - you have to write it down on your "secret ballot". This will enable those who won't try something because someone says "uh yuck" to everything. They did this with a hummus test - the first round of kids they didn't have the "no uh yuck" rule and most of the kids didn't try it or didn't like it. The second round of kids was told to not say anything until the very end, to keep their vote a secret. Only one child didn't taste it and all the kids liked it. We all have things we don't like or have a bad memory about. I ate most everything my Mom made when we were kids. The only things I remember that I really did not like were brussels sprouts, beef stroganoff, spinach and liver. I was 30 years old before I had brussels sprouts on my own. I was at a friend's house (who is a chef) - well, low and behold he was making brussels sprouts for dinner. I was like, "CRAP - I hate brussels sprouts" but, I didn't say anything because I was at someone else's house. Well I took 2 and went back for seconds! Those things were great. What I learned was my Mom had made frozen sprouts and they were mushy - totally yuck. But these were fresh and just steamed - of course, a little cheese sauce did help, and now I eat them with just some salt and pepper - no cheese sauce needed. So sometimes it's not that kids don't like something, perhaps it was just the way it was cooked. So week 1 is easy, simply add 3 fruits a day, so maybe for breakfast and lunch, and then later in the evening as a snack or dessert. Your SMART Fruit would be fresh fruits, frozen fruit without sweeteners, canned fruit packed in 100% juice or water with no sweeteners, dried fruit without added sweeteners and fruit leather made with fruit only. Smoothies are a great way to get kids to eat fruit. You can even freeze them in popsicle trays or in small containers so that can take them in their lunch. It keeps their other food cold and gives them a yummy dessert. Week 2 add 3 or more veggies to your day. Most likely you will add these in at lunch or dinner or maybe even as an after school snack or appetizer before dinner. I personally am not a big fan of canned veggies. Frozen veggies are a better option I think. They have a better texture. Plus sometimes they are easier than fresh because they are all ready to go; you just have to heat them up. Remember our newsletter from June - The World's Healthiest Foods - and use some type of stock to quickly steam or saute your veggies. One of the easiest ways to get veggies is with dip as a snack before dinner. At least you know your kids are getting veggies even if they don't eat them with dinner or maybe a salad. Be sure that you have your salad first before you eat the rest of the goodies. Another great way to get veggies in is to hide them in things they like. Pasta sauce you can add all sorts of veggies - be creative. Hamburgers you can add grated zucchini. I was a little leery of this but it was surprisingly very good. You didn't even know it was in the burger and the lean burger was very moist. A friend used to tell his daughter that the green stuff in the pasta sauce was "herbs" so she ate it up - of course it was really spinach. When he finally told her it was spinach I thought we were in for trouble. She threw a little fit, but then I guess she realized she had been eating it that way for years! Sometimes it is all on how you word things. "Special Sauce" might get you farther than Thai Peanut Sauce. Week 3 add 3 nonfat dairy foods to your day. Breakfast, lunch and a snack/dessert might be your easiest options. Your SMART options are nonfat or low fat (1%) milk, nonfat plain yogurt, low-fat cheeses (cottage cheese, cream cheese), nonfat sour cream, nonfat buttermilk, evaporated nonfat milk. Whole and 2% milk, 2% and part skim hard cheeses (cheddar, Swiss, parmesan) are more on your IN-BETWEEN list. Week 4 add 3 whole grains a day, so just one serving per meal. You can add these through breads, crackers, pasta, brown rice or even hot cereals. These are kind of tricky though. You will have to look at the ingredients and nutritional information on each item very carefully. I was in the bread aisle the other day and a lot of the labels are very misleading. The first thing I look for is High Fructose Corn Syrup and after that I see if it says Whole Grain or Enriched Grain. You want the Whole Grain. There is a formula in the book that will help you determine where your bread falls on the scale. Week 5 eat two proteins a day. These will most likely be at lunch and dinner. Be sure to choose extra-lean beef, ham or lamb, white skinless poultry, fish and seafood, beans, soy products, low-fat dairy, nuts or eggs. The challenge that most people have with lean meats is that they get dry quickly when you cook them. So to help with this, add zucchini to ground meat to make it moist. You can also add sauces like pasta sauce, gravy, bbq sauce, or ketchup. Be sure to cook thoroughly but don't overcook! Did you know a 16oz steak has about 1,600 calories? Your average meat serving should be about 3-5 oz for an adult and 1-3 oz for a child. One easy way to get meats in is to cook meat in stews, soups or sauces so you get some meat but don't overdo it. Week 6, now how to take the rest of the empties out of your diet? It's unrealistic to think that you will never eat any more bad foods. If you deprive yourself like that you will not stick on a healthy eating plan for long. You just really need to be smart about it. Go Ahead - Throw Empty Foods Away - this I have a hard time with because I hate being wasteful. I try to give things away first. Just because I am trying to eat better doesn't mean everyone else is. Eliminate Your Least Favorite Empties First - Why bother to eat something that you do not really enjoy? Double Check the Foods You Eat Often - You will be surprised at what you might find or maybe something that you missed when you read the label. Don't Get Fooled by Cost - Just because it is on sale or you have a coupon doesn't mean you need to buy it. Do that with your smart foods or even your in-betweens but leave the empties on the shelf. Check out page 150-151 for a great list of substitutes for your empties. Avoid the Empty Pitfalls by substituting great tasting smart foods for empties. You don't want to deprive your family you just want to reduce the amount of empties. The same goes for adults - we don't like feeling deprived either! Visit a berry farm and pick your own berries. I think you can still pick apples in a few places right now. Make homemade pizzas with an array of toppings they can choose from. Go to a farmers market or the produce department and let the kids pick out veggies to try. Make chicken soup together - let the kiddies chop the veggies. My niece who is 4 has her own cutting board and kiddy knife. She likes to help do this. Though I did notice she said she didn't like certain things but that I should eat them because they were good for me! 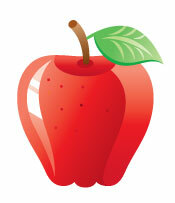 Be sure to point out times when the kids eat healthy and enjoy what they are eating. I am actually going to try the freezing smoothies and such. I was thinking of that the other day when I had pineapple that needed to be used up asap. Thought I would puree it up with water and then freeze it in cubes to use later. I need quick things in the am - I am so lazy and sleep in until the last possible minute. Or I get to distracted doing other things and lose track of time. Apples, beans (snap, pole, variety), beets, broccoli, brussels sprouts, butter beans, cabbage, carrots, green onions, herbs, leeks, mixed leafy greens (collards, kale, mustard, turnips), oats, okra, peanuts, pecans, peppers, pumpkins, radishes, soybeans, sweet potatoes, turnips. For additional information, go to www.certifiedscgrown.com. Consider limiting your baking to 2-3 favorite Empties. Experiment in changing old recipes to healthier ones. Try new recipes with healthier ingredients. Give your family and friends non-edible gifts. I think giving them healthy versions is cool though. Maybe a soup kit. I always love those. Or maybe the healthy hot chocolate mix in a cute tin, or better yet a coffee mug that is reusable. Most tins get thrown away. At big dinners, serve a healthy veggie appetizer or first course - maybe a salad or veggie tray or even a veggie based soup. Instead of putting out a tray of Empties, put out trays of fruit, veggies, or olives. Most people eat the Empties because they are there, and they can't pass up trying a little bite of them. Serve the kids non-fat milk or water with holiday treats. Keep everything in perspective. A few empties are fun just don't go crazy! From the author: Think your family will never go for whole wheat? Try this bread. I'd estimate there are less than six children in the entire United States who will turn down a warm, freshly baked roll that they helped make. In fact, I brought these rolls to my son's kindergarten class (at his request, not mine!) instead of cupcakes for his birthday. I was expecting a serious protest - but the kids loved them. Even if you have been frustrated making your own bread in the past, try this. This recipe is very easy - and forgiving if you get something wrong. Mix together yeast and water. Let it get foamy. Add in other ingredients and mix well. Add a bit of extra flour, and knead the dough about 20 times. Cover it and let it rise for between 30 minutes and 2 hours. Punch it down (literally punch it!). Shape it into a round loaf, about 18 little buns or into whatever other shape you prefer. Let it rest for between 10 minutes and overnight (in the fridge). Bake at 425 degrees, 40 minutes for a loaf and 20 minutes for rolls. **If your store doesn't carry white whole-wheat flour, substitute with half whole-wheat/half unbleached flour. Roll it out flat to use as healthy whole-wheat pizza dough. Top with bottled spaghetti sauce, grated 2% cheese and toppings of your choice. Roll into snakes, and shape it like pretzels. Then quickly dip each pretzel in water and sprinkle with coarse salt. Bake about 10 minutes, depending on the size of the pretzels. This is a fun activity for kids. For delicious apple bread, add 1/2 cup walnuts or pecans, 1/2 cup dried apple pieces (chopped) and cinnamon. Remember, you can now purchase gift certificates on our website and print them instantly. Great idea for that last minute gift! Looks like I'm here for all of November!